Like millions, or perhaps billions, of others, I share posts on Facebook that reflect my worldview and the social and environmental issues that I care about. I follow like-minded politically-motivated souls on Twitter, retweeting and liking posts I agree with, and although Instagram is primarily geared toward portraying an unreal and idealised version of life, I still manage to find images of animals like threatened Orangutans to like. 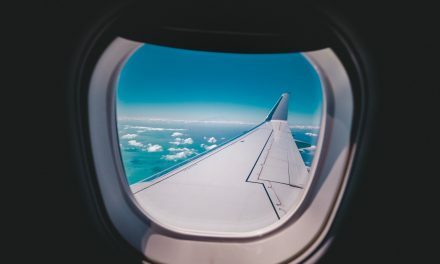 In all of this, however, as you plunge down the rabbit-hole of some new political mendacity that revs your engine, there is the nagging feeling that you are achieving exactly nothing, or at best, not much. Facebook is famously an echo chamber where you are preaching to the converted amongst your friends, family and followers, and Twitter is so plagued by trolls that civilised debate hardly gets a look-in. Living in Australia under an extremely regressive conservative federal government there are a great many issues that boil the blood of a social progressive like me. Refugees imprisoned in an offshore gulag simply for seeking a better life free from violence and persecution. Tax cuts for the rich, loss of wages and entitlements for workers and flagrant bashing of the poor and vulnerable. Perhaps the most galling for me, is that in a country that is already being hit hard and hit early by climate change, there is a government that still actively attempts to deny that climate change exists and formulates future legislation on that basis. So what to do? Well, why not do what people used to do and join an organised movement and become an actual free-range activist instead of a keyboard warrior. There are a great many single issue groups around but for me the simplest course of action to take was to get involved with GetUp! With over a million members, GetUp! is an umbrella group that bills itself as fighting for a fair, flourishing and just Australia. High profile and very effective, GetUp! has made a real impact on many issues. So much so, that it has become the target of efforts by the current federal government to clip its wings via legal action. It really couldn’t be easier to get in touch with GetUp!, they have a comprehensive web presence and are, of course, very active on social media. On the website you can see all the issues organisation is actively campaigning on and sign yourself up to become part of the community. That’s how I found myself, on a cold Monday night in winter, heading for a Strategy and Power workshop at the inner-city Melbourne GetUp! offices. Warmly welcomed by full-time organiser Rhiannon, I, and others like me, were offered a cup of tea and invited to share our backgrounds and nominate the issues we were motivated by. 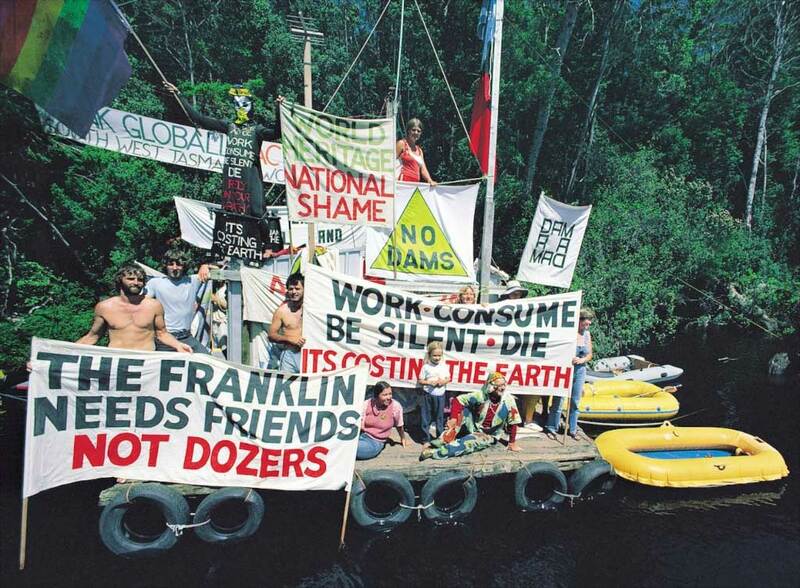 It was quickly revealed that as well as essential novices like myself that had spontaneously attended a few marches over the years, there were seasoned campaigners who had worked on globally famous campaigns like the opposition to the Franklin hydro-electric dam in Tasmania in the 1980s. 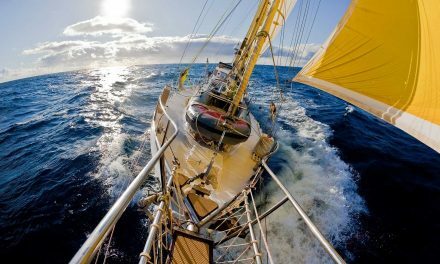 A successful campaign that protected a UNESCO World Heritage Area and helped bring down the sitting federal government in the 1983 election. Moving on to the meat of the evening, GetUp! volunteer Chris asked us to reflect on a campaign we knew of or had been a part of and identify its aims, who were most affected by the problem and who were the decision makers that had the power to deliver the change that was sought. We also identified the campaign’s key message and the tactics, activities and actions employed to win the change. For me, as a New Zealander, that campaign was to save the Coromandel Peninsula from gold mining. 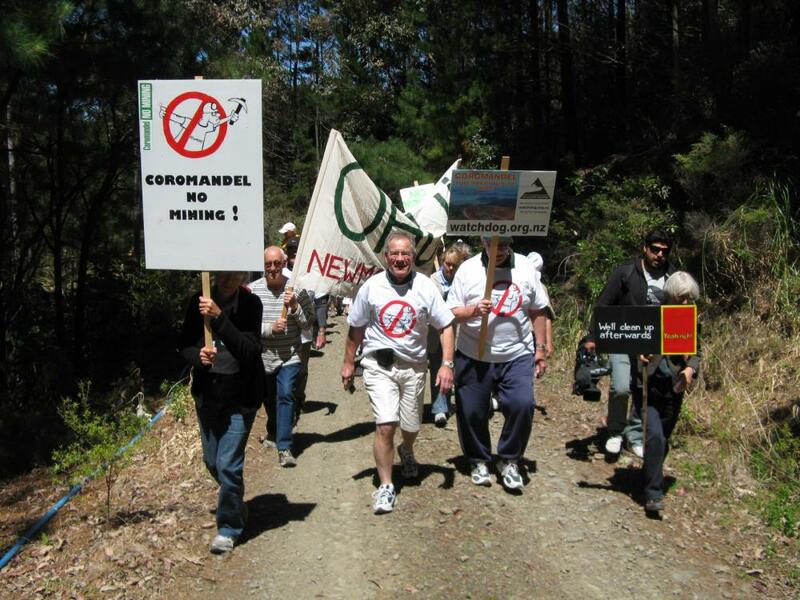 An area of outstanding natural beauty for its forests, coasts and rugged landscape, the Coromandel has also been the target of sustained pressure over decades from miners wanting to target the gold they dream is there. In the initial 19th century gold rush in the area, mining was done via thousands of shafts dug into the hills but today, miners are interested only in vast, disfiguring open-cast operations. The fight against the miners was waged over many years by local residents and volunteers led by an organisation called Coromandel Watchdog. 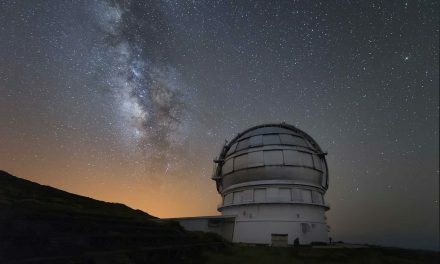 Under the slogan, ‘Coromandel — Too Precious to Mine’, the protestors finally won out with Schedule 4 protection for much of the peninsula that prevents open-cast mining but even now the miners are still trying to fight their way in there with proposals for mine tunnels beneath the surface. What that campaign taught me, even as largely an outside observer, is that these fights can be long and arduous against a determined adversary and there will be many setbacks along the way. Using insights like these, the workshop then moved on to discuss how campaigns for social change are built and sustained and what tactics are best used to further a campaign’s goals. As a case study we used the fascinating example of the Wave Hill Walk-Off from way back in 1966. As a New Zealander I had never heard of this protest but I suspect many or most Australians haven’t either. The longest strike in Australian history, the Walk-Off started when 200 Gurindji Aboriginal stockmen from Wave Hill Station, 600km from Darwin, walked off the land in protest at substandard living conditions and low wages. Wave Hill was owned by the British pastoral company Vesteys, which refused to increase wages, and the federal government in Canberra tried to ignore the situation all together. But through a national speaking tour Gurindji leader Vincent Lingiari won support from trade unions and other organisations around the country. 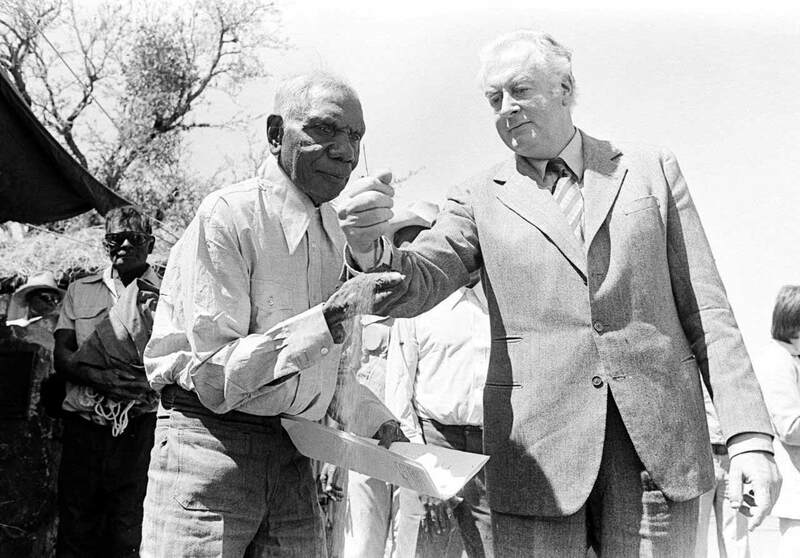 It was a long fight with many twists and turns but eventually the Gurindji people not only won better wages, they also achieved the return of their traditional land from Vesteys with the help of Prime Minister Gough Whitlam in 1972. The workshop was all over in a mercifully brief two hours that sent us all home in time for dinner but I left feeling inspired and hoping to become involved in future campaign actions. I didn’t have to wait long. Within a couple of weeks I received an urgent text message from Rhiannon to invite me to an online snap meeting to discuss the federal government’s NEG. I enthusiastically sent my YES RSVP and jumped online at the appointed time via the meeting app Zoom. The NEG or National Energy Guarantee is the federal government’s needlessly complex and hopelessly unambitious ‘solution’ for creating certainty in the electricity market and bringing about emissions reductions. The government says it will greatly reduce power prices to consumers and boost emissions reductions but independent analysis suggest it will have a negligible effect on prices, will do nothing to reduce emissions or promote renewables and locks in the continued use of polluting coal and gas far into the future. With us all expectantly online, Rhiannon informed us that GetUp! was hoping to organise a snap action within the next few days to target the Victorian Labor government as it discussed whether to sign the state up to the NEG. The urgency was based on intelligence the organisation had gleaned that other state Labor governments in Queensland and the ACT might be looking to Victoria for an indication of the way the wind was blowing when it came to the upcoming COAG (Council of Australian Governments) meeting. It felt like we were getting the inside track on state-level political machinations as GetUp! 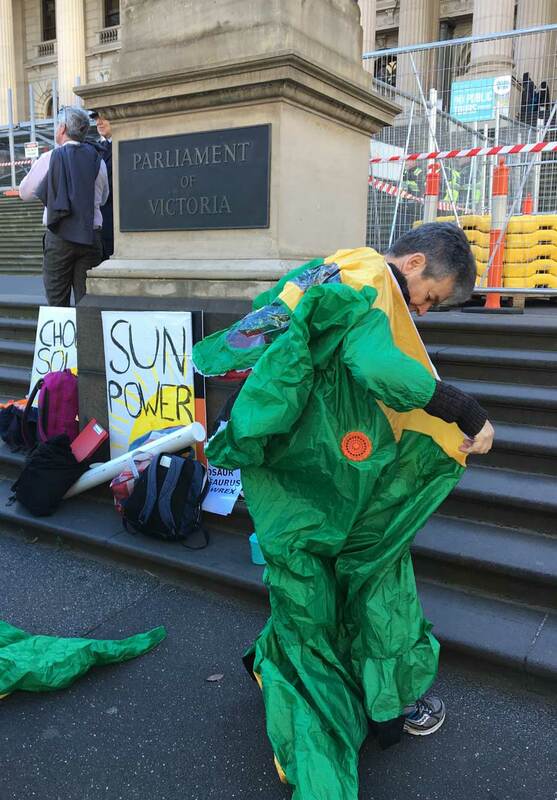 Climate Justice Co-Director Miriam informed us that the organisation had initially been focusing efforts on Queensland until it learnt that the government there might be looking to Victoria to voice public support for challenging the NEG before the COAG meeting. This meant we had to hit the streets in Melbourne, and fast. Break-out groups brainstormed ideas for attention-grabbing actions and a time and place was set. 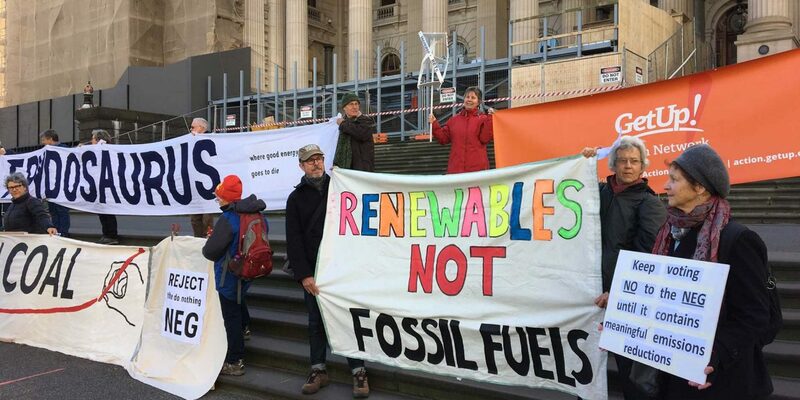 So at 10am this past Monday on the steps of the Victorian Parliament a band of good-natured and socially-committed activists gathered to unroll banners, hold up placards and give voice to chants and songs condemning the pathetic NEG and demanding better. We even enacted a harrowing drama involving federal government denyosaurs chewing on solar panels and attempting to topple a wind turbine. Since then the Victorian government has spoken out strongly against the NEG and been joined by Queensland and the ACT. The COAG meeting is tomorrow, Friday August 8th. That might sound like I’m claiming way too much credit but however you choose to look at it, I feel a hell of a lot better than if I’d sat at home in front of my computer screen.